I think I read all of Marvel’s Spider-Man related books except for Spider-Woman and Silk. Now, before you start rolling your eyes, it’s not because they are women, I do read Spider-Gwen. 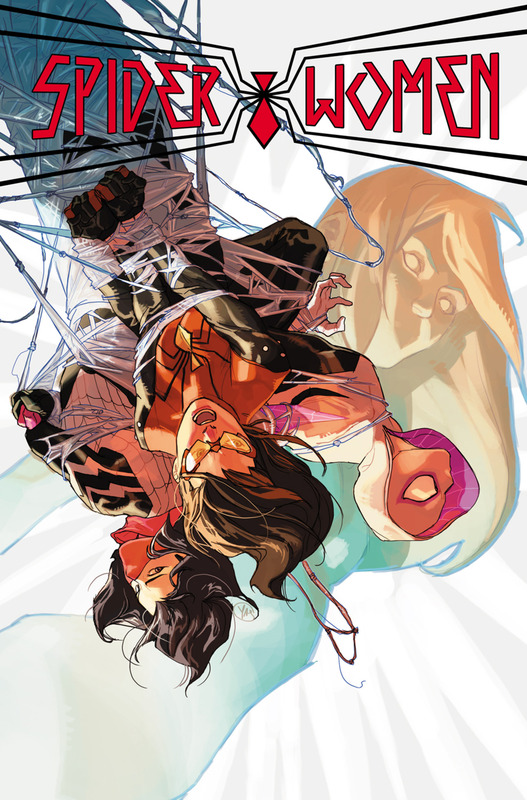 I’ve just never connected with Jessica Drew and am not a big fan of Cindy Moon. This is not a strong book. It serves its purpose by gathering our three heroes together on Earth-65 (Spider-Gwen’s Earth) and setting the events of the series in motion, but otherwise…zzzzz. It may be just me. If you enjoy the interaction between these three women as they eat junk food, grab a coffee at Starkbucks (ok, that is awesome) and talk about babies, maybe it is right up your alley. The ending has a nice hook I’ll give it that. But of course it does. That’s how they get readers (suckers?) like me to buy the rest of the books. And looking back there is actually some nice foreshadowing of the big bad reveal. I haven’t been keeping up with Jessica Drew or Cindy Moon since Spider-Verse, so many of their interactions left me cold. I don’t know that I would go so far as to say that I was lost, but there are numerous references to their solo books. And when did Jessica have her kid? I knew she was pregnant after Secret Wars, but I just read an issue of Spider-Gwen and Jessica was still carrying little Spider-Baby. My biggest complaint with this issue though is the art. Especially for a one shot that you would imagine they had lots of prep time for and wouldn’t have to rely on the regular artists of the Spider-Women books. While it features an awesome cover by Yasmine Puturi, the interior work of Vanesa Del Rey just seems amateurish to me. The storytelling is fine, but the women all look the same and strangely angular, with only their clothing and hair to really make them distinctive. Hopefully when we pick up the story next in Spider-Gwen #7, the artwork will be kicked up a notch.